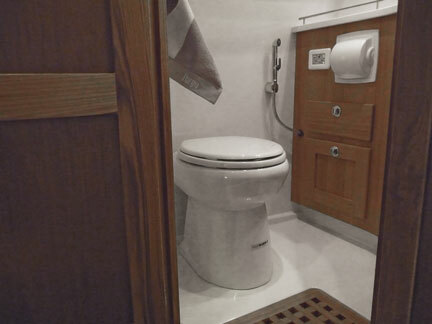 EDISON, NEW JERSEY (JULY 21, 2016) — The versatile line of SANIMARIN toilets from SFA Saniflo Inc. combines comfort, efficiency and reliability while eliminating the excessive noise associated with vacuum-operated or hand-pump units. Three models, all specially designed for marine applications, feature an easy-to-operate, push-button control panel or, depending on the voltage and model, a single push button, with no bothersome hand-pumping required. 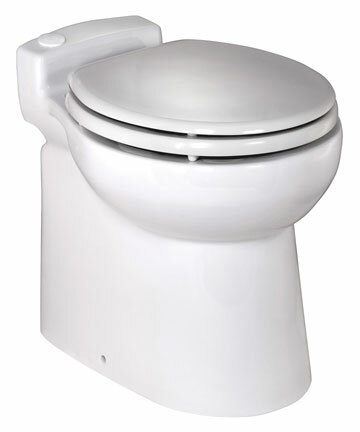 When activated, waste is flushed down from the bowl into the macerating area situated below. This matter is simultaneously pumped through a standard 1-inch plastic pipe into a blackwater holding tank, which may be located above or below sea level, for eventual discharge. 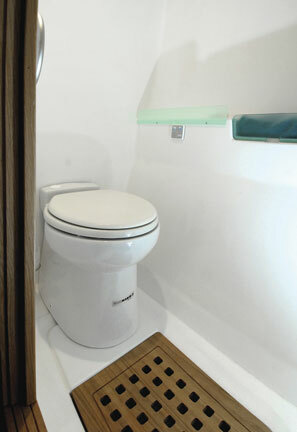 Thanks to their 10-foot pumping height and powerful horizontal pumping distance of 98 feet, SANIMARIN toilets enable boat owners to locate the blackwater tank (or purification system) wherever desired on board. Once the toilet bowl is completely emptied, the trap refills with water again. 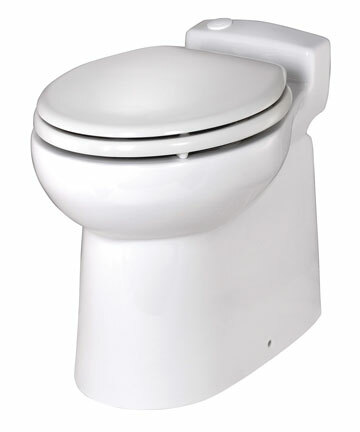 The water level in the bowl adjusts automatically at the end of each flush cycle to eliminate all risk of odors. Three distinct choices: Offered in white, all three porcelain SANIMARIN models deliver dependable performance for professional and pleasure boaters alike. SANIMARIN 31: Available in 12 and 24 volts, the compact and lightweight SANIMARIN 31 efficiently replaces toilets with manual pumps. 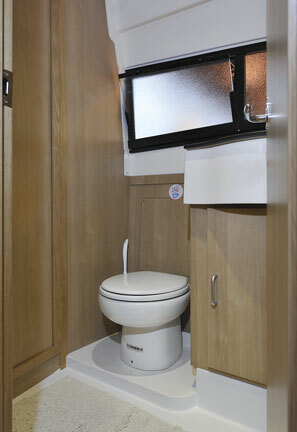 The smallest toilet on the marine market (14.5 inches W x 12.25 inches H x 17 inches D), it easily integrates into even tight spaces. 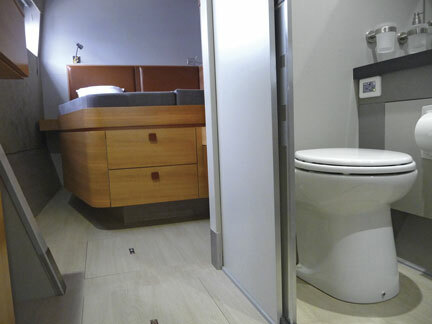 SANIMARIN 48: The sturdy and comfortable SANIMARIN 48, available in 12, 24 or 110 volts, provides an ideal compromise between comfort and practicality and replicates the comfort of a traditional toilet. All SANIMARIN models use a control console available with a chrome faceplate and featuring separate indicator lights for “Power On” and “Tank Full.” The latter shows that the holding tank is at capacity. 110 volt versions are equipped with single push button activation. All 12 and 24 volt models incorporate a dual-flush mechanism that sends only a small quantity of water to the holding tank: 0.31 gallons of water for the economical (“Eco”) cycle and 0.58 gallons for the normal cycle. The latter is adjustable to 0.79 gallons. 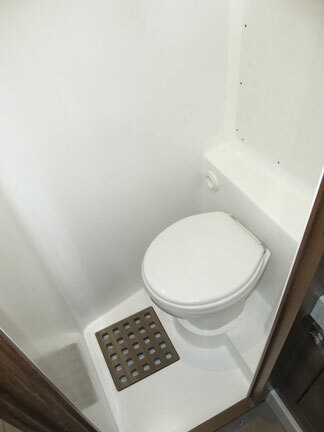 110 volt systems use 1 gallon per flush. To order the SANIMARIN online, please visit https://www.saniflomarinedepot.com/. Horizontal pumping distance: 98 ft.
Other voltages available: 110V AC with a push button for all models except the SANIMARIN 31. Weight: Model 31: 36.2 lb. ; Model 35: 48.9 lb. ; Model 48: 52.5 lb. 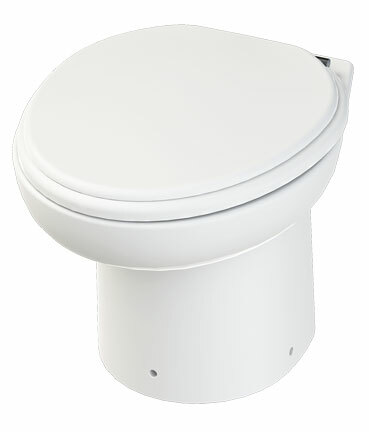 The sturdy and comfortable SANIMARIN 48 toilet from Saniflo, available in 12, 24 or 110 volts, provides an ideal compromise between comfort and practicality and replicates the comfort of a traditional toilet. 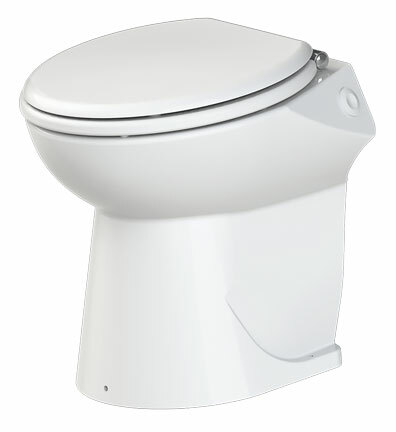 Available in 12, 24 or 110 volts, the SANIMARIN 35 toilet from Saniflo offers contemporary styling with flowing lines that allow it to fit neatly into curved hulls. 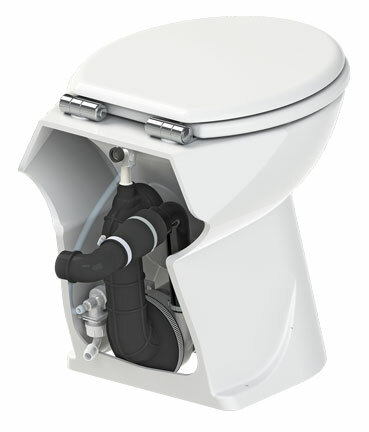 Available in 12 and 24 volts, the compact and lightweight SANIMARIN 31 toilet from Saniflo efficiently replaces toilets with manual pumps. 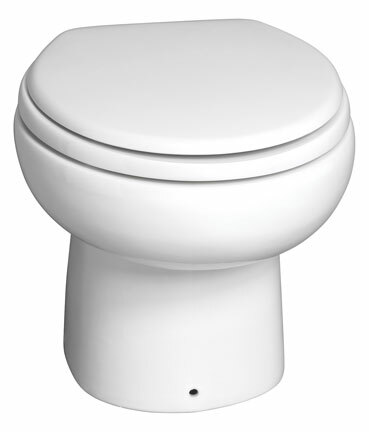 All 12 and 24 volt models of the SANIMARIN toilet from Saniflo incorporate a dual-flush mechanism that sends only a small quantity of water to the holding tank: 0.31 gallons of water for the economical (“Eco”) cycle and 0.58 gallons for the normal cycle. 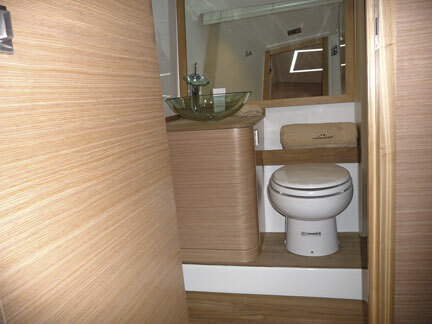 The versatile line of SANIMARIN toilets from Saniflo combines comfort, efficiency and reliability while eliminating the excessive noise associated with vacuum-operated or hand-pump units. SANIMARIN toilets from Saniflo combine a macerating pump and an electronically activated toilet into a single, compact package. 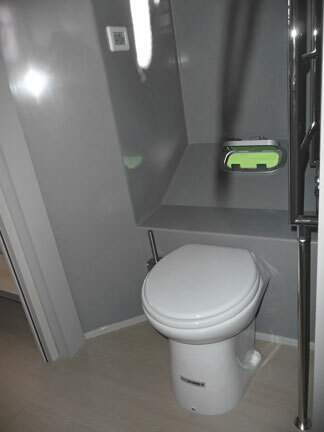 When the SANIMARIN TOILET from Saniflo is activated, waste is flushed down from the bowl into the macerating area situated below. 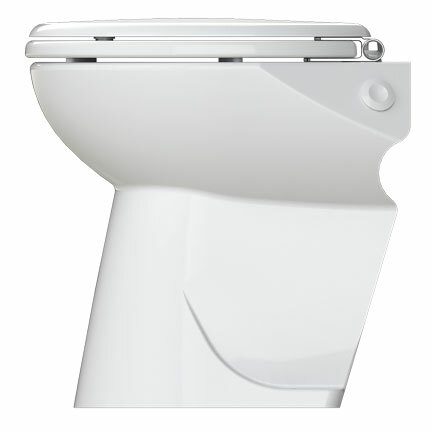 The SANIMARIN toilet from Saniflo includes a macerator with stainless steel blades that swiftly grind waste matter into fine particles in three to six seconds. 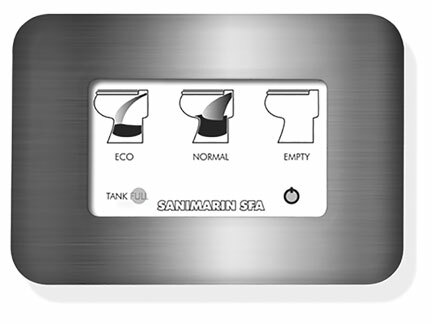 The SANIMARIN toilet from Saniflo comes in three models, all specially designed for marine applications, and features an easy-to-operate, push-button control panel or, depending on the voltage and model, a single push button, with no bothersome hand-pumping required.